I have this product for almost a couple of months now and I'm loving it so far. I have had my share of BB creams and foundations alike, but in the BB cream department, this is the winner so far! On my most days - especially office (aka work days), I prefer to have a fresh, barely-there look. I didn't want to use foundation on a daily basis either, so the much lighter BB cream is the way to go. 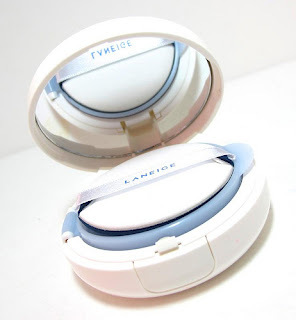 Introducing the perfect (so far) BB cream, Laneige Snow BB Soothing Cushion! It doesn't cake. It is well-formulated that no matter how much I sweat, it doesn't give a cakey, tell-it-all look and feel. It blends perfectly with my skin tone. I am using #21 (Natural Beige) and it fits perfectly with my color. What I like is that unlike other products, it doesn't leave me looking like a ghost while I wait for it to oxidize. After applying, I'm done. Barely-there, dewy, natural finish. The texture is light and it feels like you're not wearing anything at all. Just ideal for everyday use. The smell. You either like it or don't like it (especially those who prefer unscented makeup). I admit I was one of the latter but the scent grew on me. It's just a very mild scent, by the way. It comes in a compact, so retouching won't be a problem anytime and anywhere. It has SPF 50 PA +++. No need to worry with applying sunscreen separately. That's a big plus for lazy old me. Comes with refill. So yes, it's refillable. 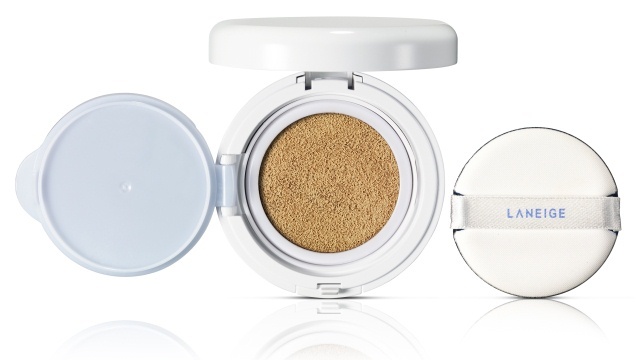 The puff and mirror comes in the different compartment with the BB cushion itself. No breakouts for my sensitive skin. Hooray to that! Cleaning the sponge. I am sort of OC with cleaning sponges and brushes on a regular basis and I haven't perfected yet how to clean the sponge/puff! I find it hard! Overall, I am happy with the product and definitely, the PROs outweigh the CON. It is one product I will definitely repurchase and use again. To know more about the product, read more at the Laneige page. Laneige Snow BB Soothing Cushion retails at $52 at Sephora.